Two nights down and at least three more to go! So far we are managing to keep the costs low but the food quality great. For tonight’s meal we will be keeping it simple. Every few nights a week I feel that I need a simple cooking night. You know, the night where it is just an easy task involving few dishes and simple ingredients. 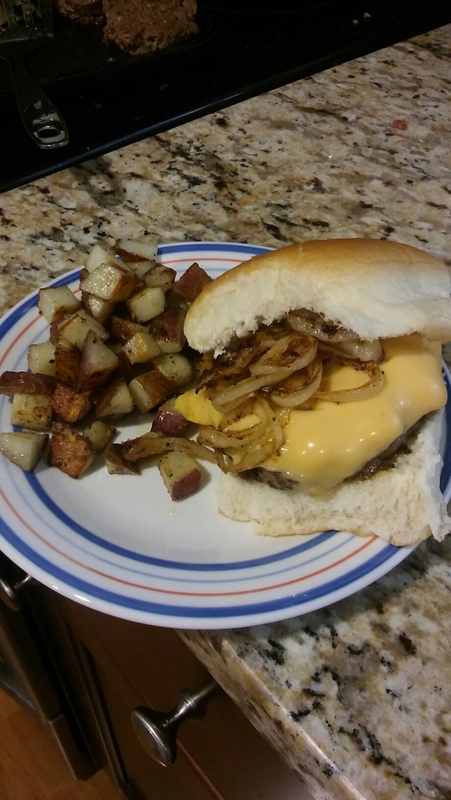 Tonight’s meal will be hamburgers, peas and diced fried potatoes. Simple ingredients that we can all cook so let’s get started. First, scrub a few potatoes until they are nice and clean. Using a sharp knife cut them up into nice diced pieces about ¼” to ½” squares are usually the best. Try to keep them all about the same size, this will prevent burning or undercooking part of them. Using a large frying pan add about 1-2 Tablespoons of olive oil or whatever cooking oil you have on hand. 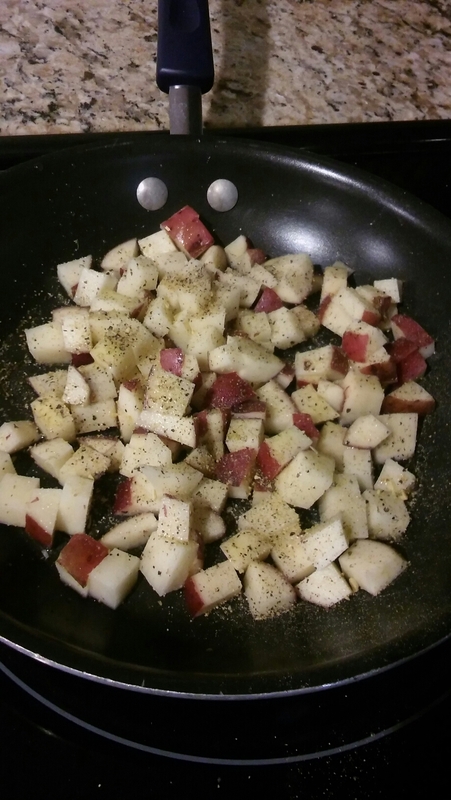 Get the pan nice and hot and then add the diced potatoes. Turn the heat down to about medium depending on your stove. Season them with salt and pepper. If you have a garlic and herb blend this is also wonderful on the diced potatoes so feel free to add that too if you have it. While the potatoes are cooking prepare your hamburger meat. Take the ground beef and add salt, pepper, a bit of seasoned salt and a dash of cayenne pepper ( if you are feeling spicy). Mix it well to ensure the spices are spread throughout the meat. 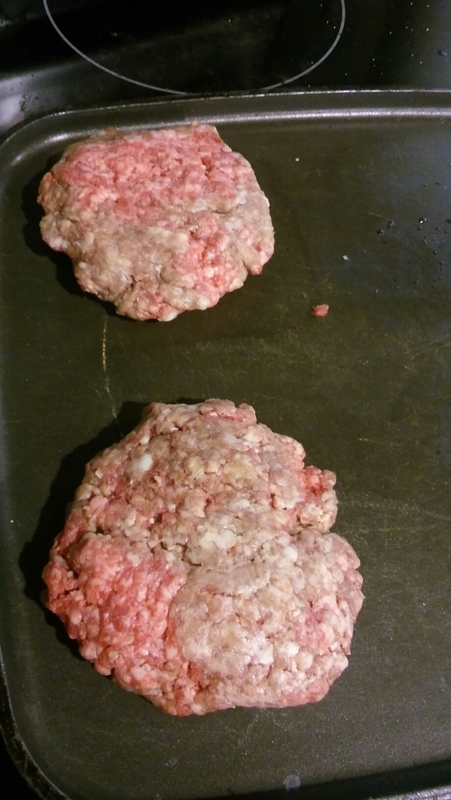 Form the ground beef into patties and fry them up in a nice warm pan as well. Do not cook these to hot or too fast or they will dry out. When the burgers are almost finished butter the insides of your buns and throw them on the pan as well. They will turn brown and perfectly crispy after just a few seconds (15 seconds at max!!! so watch them close). Heat up your peas in a small pot and prepare your plate. Serve up all your homemade goodness and enjoy! No peas for tonight for this one. Variations for your burgers can include slices of onion, lettuce, tomatoes, ketchup, mustard, hot sauce, or any other goodies you like. Enjoy! From tonight’s meal if you have any leftover peas be sure to save them. Put them in your refrigerator next to the green beans and mashed potatoes from the other night so everything is waiting for you in one place. Cost for this meal is about $1.45, based on an individual eating about a cup and a half of finished product. Prices may vary based on location of products. Tomorrow night we will start using up those leftover goodies. Just wait until you see the simple thing you can do with a few basic leftovers.